It was a very nice training . I would like to thank Knowledgehut and our instructor for providing us an environment where we were able to understand the concepts and able to clear the exam successfully. What is the course all about? This CSD certification in Washington on agile management allows you to learn an incremental, iterative method to build activities. These activities can be involved in business, information technology and engineering as a whole. It is used to provide a new service or product in an interactive manner that is flexible as well. This management style is built on the foundation of successful scrum topics that lead to effective management of a project. The agile approach in this CSD training in Washington allows students to widen their skill set within the broad area of successful management styles. Benefits of this course The training gives you the advantages of being skilled in communication, delivering a working application, collaborating with clients and being iterative in your approach as you build your activity and deliver the product. This Agile manifesto can be used to build activities to develop products out of the information technology sector too, making this online certification even more valuable. The KnowledgeHut Way Doing CSD or Certified Scrum Developer training in Washington by KnowledgeHut allows you to reap the benefits of online learning in the most effective way. With practice sessions along with lectures, this coaching institute gives you the best in the field. The course fee for the CSD course in Washington is affordable and taught by experts in the field, allowing you success to professionals at a low cost. 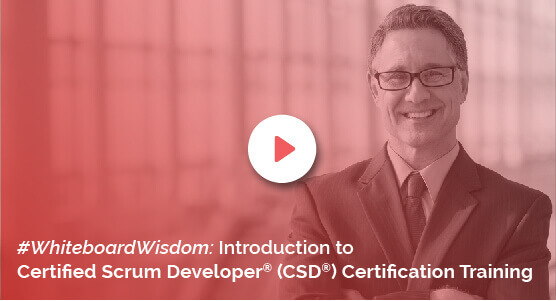 Register for the demo to make sure this course is the right fit for you before you enroll for the certified scrum developer certification.